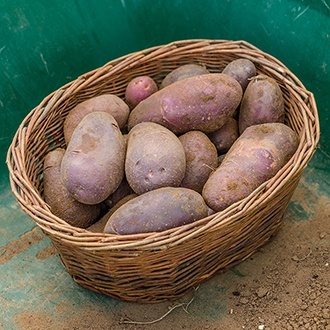 Known as the ‘Blue’ Sarpo, this variety is famed for its excellent resistance to the late blight of potato tubers and also its good, general disease resistance. Quoted as the best roast potato ever, Blue Danube has a high dry matter content, so is perfect for roasting, chipping and baking. Because of its inbuilt dormancy it can be harvested in autumn and then kept in a cool, dark and frost free place right though until spring without sprouting or softening. We’re excited to introduce three more Sarpo varieties of seed potato – all bred and developed for their great taste and unique blight resistance. Whether for the veg garden at home or larger scale plantings in the allotment, we know you’ll enjoy harvesting these delicious, freshly dug spuds.